The special Collector's Edition is full of exclusive extras you won't find in the standard version: Bonus adventure, built-in Strategy Guide, concept art, desktop wallpapers, soundtracks, and a full free version of Forgotten Riddles - The Mayan Princess. 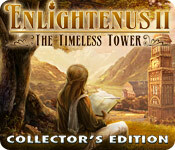 The Enlightenus games are related only in their style of hidden object gameplay. Instead of a list of items to find, you are provided with an inventory of items to put into to use on the hidden object scene. These items are often as haphazard as the items that make it into each hidden object location, and sometimes it is not a matter of knowing what to look for but mousing over various objects until something likely is found: For example, it may not be obvious what to do with a golden banana until you happen to see or mouse over a golden gorrilla, which in turn may have no reason whatsoever to appear in the jungle scene. 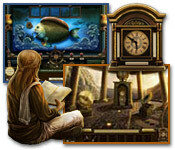 The fantasy game art is in the different hidden object scenes as well as some of the game world locations.